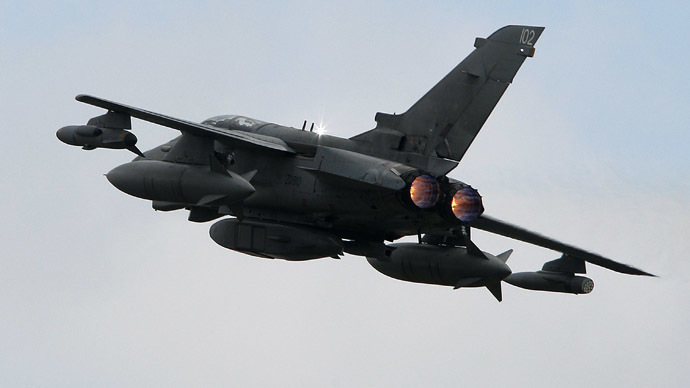 ​Tornado bombers from Britain’s Royal Air Force (RAF) have carried out their first attacks against the Islamic State in Iraq, according to the Ministry of Defense (MoD). "This action is part of the international coalition’s operations to support the democratic Iraqi government," the MoD said in a statement. “In the course of an armed reconnaissance mission from RAF Akrotiri, two Tornados were tasked to assist Kurdish troops in north-west Iraq who were under attack from Isil (Isis) terrorists,” the statement continued. Two Tornado GR4 aircraft were used, which are now based at RAF Akrotiri in Cyprus. The Tornado is an all-weather day and night fighter bomber, which has been in use by the RAF since the 1980s and is now becoming a little long in the tooth. According to the statement, the patrol identified a heavy weapon position belonging to the Islamic State (ISIS/ISIL), which was attacking Kurdish forces in the area. The planes used a Paveway IV guided bomb and a Brimstone anti-armor missile to take out the position, as well as an armed pick-up truck. Until now, RAF Tornados have been limited to flying reconnaissance missions over Iraq, and only began armed patrols after the UK parliament agreed to authorize military action against ISIS on Friday. UK Defense Secretary Michael Fallon has said that RAF planes could be engaged in bombing ISIS for years to come. Although there is widespread skepticism of the effectiveness of airstrikes, Prime Minister David Cameron has insisted that they are crucial in the future destruction of the hardline Islamist group, adding that the most important tools in the fight against the Islamic State are better armed Kurdish Peshmerga fighters and better trained Iraqi troops.